Tara and I have been married for 15 years, and we have 3 biological children. In 2014, we took a missions trip to the country of Haiti. It was durring that time that we feel in love with Haiti and it's people. God truly broke our hearts for the need that is there, and began stirring our hearts with compassion. On the plane ride home, we knew God was calling us to something, we just weren't sure what it was yet. A few weeks later, we knew what God was leading us to...adopt a child from Haiti. It was not a hard decision to adopt, because we really feel like it's a calling on our lives. We spent months praying about it just to make sure our decision was not an emotional one. So after much prayer, we knew exactly what we were to do, adopt from Haiti! Not to our surprise, our 3 children are so excited about the direction our family is going. We have never seen his face, but he already has a place and a name here in our hearts. We know that this is something God has called us to and we are stepping out in faith to follow His calling. International adoption is a very expensive journey, but we belive that if God has called us to it, He will see us through it. We also belive that God will use other people to see this calling come to fruition. We are using Adoption Bridge as a way to encourage other people to be apart of saving a life! Giving hope to a child who is in great need. We can do so much more together than we can alone. We ask you to please prayerfully consider partnering with us, both in prayer and financially. Thank you so much! Isaiah 42:1 - "I have called you by name and you are Mine." We are so excited for your family and this journey you are on. You have touched our lives in so many ways and this is just our small way of letting you know that we love you and appreciate you so much! We can't wait to meet your little boy! Congratulations! Isaiah and your family will be in our thoughts and prayers for a safe journey. We wish you all the best. Many many blessings! Very excited for you all... especially Isaiah! We are happy to help. We are praying for success. I love you guys and can't wait to meet sweet Isaiah! I have been praying for you and for him for a long time, and I will continue to do so. Love you all!! My heart and prayers have been with you all ever since I knew of this journey. You have so much love to give and your new son has been designed by God to belong to you. So excited to get to be part of this journey! We love you guys so much. We are so excited for Isaiah to arrive. We are so excited for you guys. Love you and keep us posted on how things progress! Love, the Cooks! It is a blessing that you are following God's leading. We will be praying you reach your goal quickly. Can't wait to meet your boy! We are so excited for you guys! Can't wait to meet Isaiah! May God Bless you as you live out the adoption we have been granted in Jesus Christ. Praying for you all and Isaiah. We look forward to meeting your son. All our love and support! So then, as we have opportunity, let us do good to everyone, and especially to those who are of the household of faith. ~Galatians 6:10 Our thoughts and prayers are with you and Isaiah! What a blessing to know that when God created Isaiah, he was created to be a part of the Olsen Family. God is Amazing! God bless your family (including Isaiah)! We are praying for your family! Can't wait till he's home! Congrats to your family. We are so excited for you guys! God Bless! We are so excited for your family!!! Praying for you guys through the process, and little Isaiah! This is awesome of y'all. We have been praying for this for a while now. We can't wait to meet him. Congrats! Y'all will be perfect for him. So excited for your family. Glad we could be a part of it. 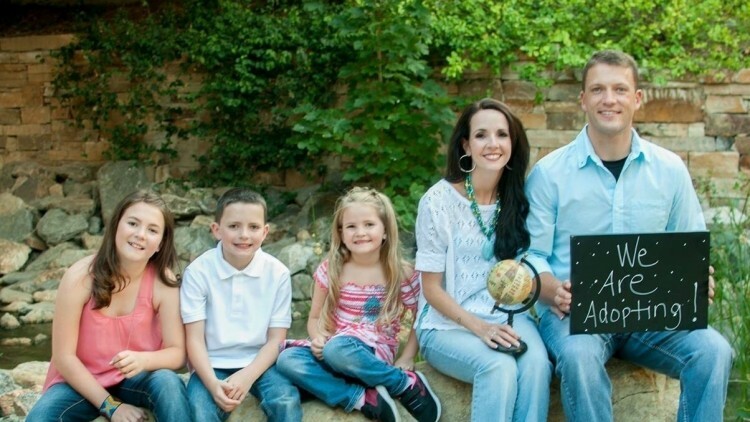 We are so excited for you and pray that the adoption process goes smoothly. It is exciting to see you guys follow God's leading and adopting Isaiah from Haiti! I will be praying for you guys throughout your journey. If there is ANYTHING I can do to help your family prepare for Isaiah please let me know. We hope to give more in the future. We still have our own adoption expenses leftover.......Let me know if it would help your children to talk to Claire about what it is like to have a new sibling in the family. We will keep your family in our prayers! We are so happy for you! I love you all so much! Can't wait to meet Isaiah!